The phrase ‘story ballet’ tends to evoke largess; grand productions where an elaborate plot unfolds over the course of an entire evening. But just as stories come in many forms, so too is the relationship between story and ballet diverse. Of course, there are many examples of the epic two/three-act ballet, but shorter movement essays, poems and novels are just as prolific in the canon. And I often find shorter dances to be more successful in communicating their narrative; the brevity breeding a clarity and succinctness that gets somewhat lost in larger works. Kicking things off was Itchy Bot Bot (A Family Portrait), choreographed by Danielle Rowe, SFDanceworks’ new Associate Artistic Director. Here was a work about the space between perception and reality, told through familial dynamics. With arms hanging forward and feet stamping abstractly through her pointe shoes, Ramona Kelley’s daughter character was at first sullen and pouty. In contrast, on the other side of the stage, Emily Kerr and Richard Link beamed from ear to ear, proud parents of their graduate son Landes Dixon. Darwin Black, as the photographer character, wandered throughout the scene, snapping pictures of the happy family (the daughter’s moody quality gradually softening to play the part of the dutiful child). But what lay beneath these frozen images? Itchy Bot Bot (A Family Portrait)’s choreography suggested much was percolating right under the surface. In a series of solos and duets for all five, unexpected positions permeated the space, like piqué turns with the leg out in 2nd position. As did an abundance of flexed feet, abruptly breaking the line of the leg in unanticipated ways. What was illusion? What was façade? When might the pretense shatter? Rowe posited the questions, but cleverly left them unanswered. I had a pretty clear sense of what the ballet was about, but I still had some differing observations. That’s not a criticism at all, it’s the result of dance and visual art conversing together in a creative container. Samantha Bell and Coral Martin opened Kimono Wednesdays, both holding gilded picture frames. In the program they were listed as ‘agitators disguised as portraits’, but I saw something else. As they extended their arms and legs through the empty squares, they blurred the boundary between art and life. It was like they were entering Monet’s painting and in turn, leading us inside as well to experience its internal themes. Lowe unpacked these themes through three striking pas de deux. Vincent Chavez (presumably as Claude Monet) partnered Sharon Kung as the Japanese Spirit, Kelley as the French Spirit and Kerr as Camille Monet. But to me, the three women read as three distinct aspects of Camille’s persona. Kung contributing playfulness, Kelley adding speed and allure and Kerr, a skillful, mature game of flirtation. With arms sculpting the space and the most amazing penchée, Martin invited the audience into the world of Giggling Flame and Roaring Waves, choreographed by Antoine Hunter. A narratively-rich work comprised of four brief episodes, the notes say that the piece “…explores the journey to Deafhood…”. With Giggling Flame and Roaring Waves, Hunter, who is deaf, has crafted a powerful statement that disrupts assumptions with every chapter. But the narrative isn’t the only thing that makes the dance special. The movement itself, a new kind of fusion between ballet and jazz, impressed with its innovation and specificity of position. The first group sequence brought a number of themes to the table – isolation as dancers were left out of groups; learning as gestures were repeated and honed; even some camaraderie as hands were extended in belonging (that feeling would certainly intensify as the dance went on). A slow, deliberate series of cluster shapes made up Giggling Flame and Roaring Waves’ second segment, the cast working together to create the picturesque landscapes. I was particularly intrigued by how the facing of the clusters changed a little bit each time, like the ensemble was mirroring a clock on the surface of the stage. Perhaps a comment about how a community grows stronger and stronger as they log more time together. Part three brought a short solo movement improv, steps and phrases emerging from text prompts. And the final sequence saw the entire ensemble return to the stage – a community of individuals engaging and celebrating together in full-throttle physicality. Chavez and Kelley’s La Llorona had a solid start, another work steeped in family dynamics. In this story, spontaneity was juxtaposed against inflexibility, and as the ballet unfolded, questions of rigidity and cost were asked. What relationships and experiences are lost by an inability to bend and adjust? According to the synopsis provided, La Llorona’s story takes a dark and tragic turn in its second half. This is the point where the narrative thread got a little fuzzy onstage - if I hadn’t read the program, I likely wouldn’t have known what was happening. A number of events and dramatic moments need to play out (and they did), it just all happened too fast. I’m usually a huge advocate for editing and shortening works, but I think this is the one ballet on the bill that needed to be a bit longer in order to really capture and communicate the whole story through movement. 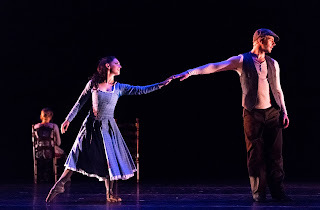 I had read Edith Wharton’s Ethan Fromme ahead of Cathy Marston’s Snowblind at San Francisco Ballet last month, so the story was fresh in my mind. Fittingly, Bat Abbit choreographed his The Sound of Snow around the book’s primary love triangle between Ethan (Christopher Dunn), his wife Zeena (Bell) and her cousin Mattie (Kelley). Swirling wind sounds signaled a bleak environment; ragtime music took us back in time. Ethan’s first solo was filled with gesture and disappointment. Dunn reached to touch something he couldn’t grasp; faster and faster, he ran on the spot, unable to move forward. He was stuck – stuck in his relationship, stuck in his circumstances. Zeena’s fragile, ailing body was expressed as Bell clutched her stomach and teetered precariously backwards in space; her anger and resentment (at her situation and at Ethan) through angular, sharp staccato motions. And then newness arrives on the scene, a breath of fresh air, a joyful innocence - Kelley’s Mattie. Mattie and Ethan’s duet was filled with playful, easy energy. For an instant, they touched palms, only to pull away. All possibility and promise, long-stretchy extensions moved outward in space. But events transpire and the relationship between the three is forever altered. Abbit’s The Sound of Snow riveted with its dramatic choreography and a nuanced plasticity between the three characters.